If you are contemplating planting some fruit trees on your allotment this winter then the recommended time to do this is November to March. Trees you purchase will usually be ‘bare rooted’ and for the allotment a ‘dwarf’ or ‘semi-dwarf root stock’ would be ideal so your fruit trees do not take over your allotment. The latest thinking on how best to plant your new tree is to dig a hole deep enough to take the root ball with the bottom of the hole well dug and broken down. Make sure the planting hole is fairly generous in size and ‘square’ in shape – which allows the roots as they develop to break out towards the four corners. Also, do not add any manure or other fertilisers into the planting area as this inhibits the natural growth of the root system and forces the roots to go looking for its own nutrients and moisture, which in the long term will give you a healthier tree. After planting the tree ‘upright’ back fill with the soil you removed and firm the ground all around with your foot, then finish off with a good surface mulch of chipped bark/wood chippings or similar to conserve moisture. Finally, it is a good idea to implant a stake offset from the tree and then to nail onto this stake some form of circular fencing material (chicken wire is ideal) sufficient to keep deer and rabbits away from the new tree trunk until it has established itself. 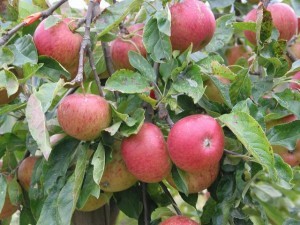 During the first year or so it is important to ensure you keep the tree well watered in the very hot dry summer months.